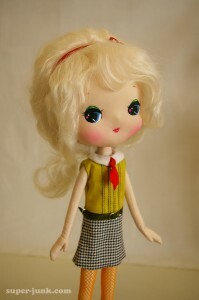 Olive will be available by 48-hour (2-day) FREE Lottery from Tuesday, March 22 2011 at 12:00 noon PST. Visit super-junk.com to enter. One name will be randomly chosen and the winner will have the opportunity to purchase Olive for $200 + shipping. Wait! lol, I don’t understand!! I’m sorry if I’m missing something super obvious! (been trying to organize my kitchen so I can paint it all day…) ugh.. Brain is munch, is there somewhere we can send $$ so that we can be entered into the lottery?? Hi Ladies, sorry for the confusion, I perhaps posted that too hastily! Tomorrow, I will put up instructions to enter. The lottery will be free, all you have to do is give me an email address. I will draw one entry at random to have the opportunity to buy Olive. Hopefully this takes care of the duplicate-purchase and fastest-finger headache of just letting the first person buy her. Plus I won’t feel guilty about folks in different time zones not getting a fair shot. I really am trying to make the purchasing process easier, I promise! I wish I could make them faster!